up a good business just before it has started. Sometimes it happens that a promising good business ends in tears. In recent months two Polish Network Marketing leaders, Grażyna Magdziak and Stanisław Szymczak , have experienced such an end. Last automn they have started cooperation with two German “businessmen”, Daniel Müller and Aleksander Herr (www.intma.ch), the networkers who suggested them building Polish structures of Unicity Europe Inc. (www.unicityeu.net). The offer seemed to be very attractive. The company originated in the USA (www.makelifebetter.com) is a producer of high value diet supplements and it has been operating in Network Marketing for many years. Therefore, such a well known brand [in the Eastern Europe] was above suspicion. Moreover, four years ago the American representatives of Unicity tried to launch Poland. Especially as the organizer of the Polish Unicity structures occurred to be a man who has the rank of a diamond in Unicity structures. His name’s Alexander Herr and he is directly responsible to a double diamond, Daniel Müller. A reliable company, a promising product (Bios Life Slim, a diet supplement boosting weigh loss), the support of Unicity’s high rank businessmen, together with the experience and connections held by Grażyna Magdziak and Stanisław Szymczak, all of these factors have portended well for the future and it promised a very lucrative MLM business. Alexander Herr has became a sponsor of Szymczak who in turn has sponsored Magdziak. The Polish characters have signed the applications of cooperation based on the network franchise. They have invested money in the starter kit, have received their own ID numbers and have been signed in the official internet page of the Unicity company. They have immediately started working and building their own structures to achieve as much as they could before the official opening of their business in Poland. – I can’t tell it was easy. We were organizing everything on our own. To get such a good result I had to invest much of my private capital. I have paid for the translation (from German) of contracts, materials concerning the product and an internet site www.erfolgsteam.pl. I do realize that in order to succeed in business you need to incur some expenses. However, the lack of Mr. Herr’s financial support, who has claimed that only him as a diamond in Unicity can open a new market , has started to puzzle me since then – admits Stanisław Szymczak. However, extremely good results of the actions taken compensated for all the doubts. Numerous presentations and training sessions all over the country were producing real effects. The structures were widening and lenghtening, the number of people interested in the cooperation was growing. Unfortunately once again it has occurred that, as it very often happens, where the money is there will always appear people who want to take advantage of another persons’ individual success. The mistranslations are just a prelude to the impropriety in the subject matter. On the 12th of May Alexander Herr sent an email to all the Poles connected with Unicity, which brutally accused and slandered Magdziak and Szymczak. It accused them of telling lies, plotting, sabotaging the meetings, breaking agreements, postponing the payment for manager kits, etc. As a result of those charges our characters have been definitely, with no comment, excluded from all the meetings and presentations taking place in Herr’s structures. They have immediately diasppeared from Unicity structures present in the company’s internet page. For the obvious reasons the accusations have caused unrest in the people connected to the case. According to Grażyna Magdziak and Stanisław Szymczak all the accusations made by Herr were to discredit them in the eyes of their associates. They both emphasize that this attack was unexpected and extremely unpleasant, especially for the fact that they have always been caring for their good reputation when working for years in many other MLM businesses. This makes us to put a question: why to attack people who were so devoted to building a common success? Everything indicates that the reason was very clear and notable at the same time. It occurred that before the unfortunate email was sent, our Polish characters had been deprived of all the people in their structures. In the Unicity websites all the people who concluded a contract with them have been ascribed to another sponsors. Szymczak had been deprived of such partners as Grażyna Magdziak, Janusz Kłak- Kirstein, and nota bene the Mariusz Piątek. Mrs. Magdziak, in turn, had been deprived of such people as, for instance, doctor Helena Czarnojan. As we all know, in no respected MLM business such reshuffle can be done. Not only is such action unethical, but it also obviously violates the rules of network marketing in general. – It was me and Mrs. Grażyna who built Unicity structures in Poland. We have concluded contracts with the key people on whom all the structures are based now. Yet, the contracts have been forged and now in Unicity websites other people are present as their direct sponsors – says Stanisław Szymczak. – The most stunning fact was that initially Herr and Piątek were trying to get my assent to take those people away from me. Mariusz Piątek asked me for this several times, he even offered me money. Of course, every time I refused which resulted in slanders and attacks. It came as surprise to me. I work in MLM for years and I have never seen such a practice. I have always tried to build my business relations on the basis of partnership. The moment of concluding a contract is always preceded with long conversations and consistent trust building. Therefore I could never let myself to break those bonds – adds Grażyna Magdziak. 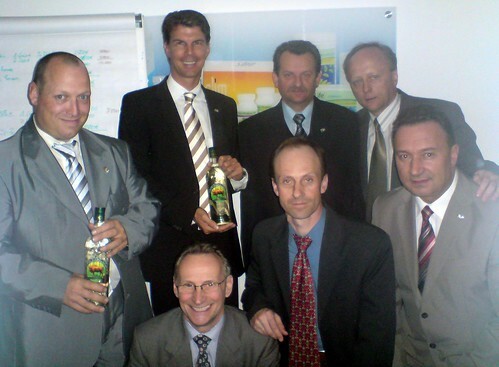 Other people who were also involved in building Unicity structures in Poland also had reservations about Mr. Herr and Mr. Piątek’s behaviour. This was true in the case of, among others, Marek Szaroletta whose sponsor has been Mrs. Magdziak. He claims that he was proposed to take part in changes concerning the structures’ configuration. As many others, Szaroletta is appaled by the groundless charges against the people who were opposed to the aggressive and unethical ways of building a business. Slandered and deprived of their structures Grażyna Magdziak and Stanisław Szymczak have reported to our editorial staff. Being convinced that such activity is unacceptable in any business, we have decided to examine this case. One of the steps we have taken was sending an email to the central office of Unicity International in Bad Homburg. In the email we asked for the official comment on the situation. Imagine our astonishment when we received a reply saying that the head of the company, Gerd Niedernhuber, claims that Polish distributors have never been in Unicity structures and Poland is not a country in which Unicity operates (???). The case could have been now closed with a statement that Herr was acting lawlessly in Poland on Muller’s command. It could have been done this way but for such obvious facts as giving the Poles ID numbers and their appearance in the official Unicity internet page. Additionally, Stanisław Szymczak has personally met Gerd Niedernhuber and was given his calling card. It appears that the Unicity management is playing stall for time which is reflected in the evasive responses to the complaints made by Mr. Szymczak. Such a policy is very weird. In every network marketing business can appear some black sheep among its representatives, which should not have a direct impact on the company or industry. In this case, however, at least from the perspective of the current events, the actions of Unicity’s central office prove their lack of professionalism, perhaps even their consent to abuses. Another fly in the ointment have been the certificates. In spite of the fact that Gerd Niedernhuber assures that the company never sells its products without the appropriate licenses, in numerous meetings in Poland it has been said that the company “is in their way of getting the demanded certificates”. It has been confirmed by Peter Wieloch who was present at one of such meetings and personally asked the question concerning this matter. Let us come back to the case of Mrs. Magdziak and Mr. Szymczak. After Network Magazyn have became interested in this matter and made an intervention attempt, Alexander Herr made an about-turn and decided to come to an agreement with the main characters of this story. In this place the story we’re telling starts to proceed in two directions. There has been a turning point in the case of Mrs. Magdziak (only ostensible,as it quickly occurred). Herr has withdrawn his charges against her. In the official post to the Polish franchise partners he has apologized for the charges explaining that they have been a result of a mistake. – June and July have passed, as well as August, and… My only gain is that in my structure reappeared Helena Czarnojan and the people sponsored by her. I haven’t received a short email containing apologies and a request for the number of my account to which should be sent the money I made by my hard work. I just think that the serious businessmen do not act this way – emphasizes Grażyna Magdziak. There has also been a confrontation between Mr. Herr and Mr. Szymczak. It took place on the 20th May this year in Radisson hotel in Szczecin. To protect himself against linguistic inaccuracy Mr. Szymczak came with Marcin Wiliński, a man who spoke German. It occurred that even this move didn’t save him from signing the statements in which he withdraws all the demands and complaints concerning Mr. Herr. – The meeting was held in a very weird and nervous atmosphere. Mr. Herr was in a great hurry, excusing himself for it with an urgent departure of his plane. As a result of the haste, some mistakes translation mistakes appeared and the whole meeting was manipulated. Mariusz Piątek took part in that meeting as well and he was repeating all the time that he has never entered into a sponsoring contract with me. It was a really strange statement, especially for the fact that I still have his email in which he thanks me for having a contract with him – emphasizes Szymczak. Having Mr. Wiliński’s declaration who admits that during the meeting there were no evidence that would prove Mr. Szymczak being guilty of the charges against him, Mr. Szymczak decided to stand up for his rights. And it’s worth it. After all, several months of his hard work brought very good results for which he should be paid. Not to mention a due compensation for all the other offences that met him and Mrs. Magdziak. That’s right. Intima guys, who try to implement Unicity products, were never able to show up demaded in Poland certyficates and licenses. “Das Networker Pancerfausten – Biznesfan” was a superb blog post and also I really was indeed quite satisfied to locate the blog.